I've been knee deep in Wedding Invitataions all week & today is my son Brandon's birthday so forgive me for being a bit out of it this past week!!! I can happily say that Juliana's invitations, response cards & info cards/directions are all done & now I'm out of BRIDEZILLA'S way LOL!!!! Anywhooo, onto my post for today! Welcome to another Etsy Saturday & our featured shop this week is called "Quiltish from Allisa Jacobs". She creates beautiful bags, pouches & baby items in gorgeous colors....you're sure to find lots of inspiration from her so be sure to check out her shop! This week's lucky winner will receive the gorgeous ribbon you see pictured above from May Arts! How do you win? 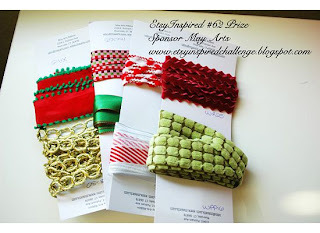 Visit the above shop, pick your inspiration, make whatever creation your heart desires & link it to the EtsyInspired Challenge blog. Have fun & I can't wait to see what you create!!! I'll be busy most of the day today with Brandon's Birthday & work but I'll be back on Monday with a new post! Thanks so much for stopping by & I hope you all have a wonderful rest of the weekend!!! wow another year older!!! HAPPY BIRTHDAY BRANDON!!!!! and jackie.... what a stunning card! fabulous! I am trying to get back to visiting blogs and your's is my first stop today. Love the bright cheerful Christmas card! Happy birthday Brandon. Love your blog Jackie, sorry its been a while since I visited. Your cards are so lovely! Your Noel card is beautiful, perfectly put together. Wow! These colors just pop! I'd say you nailed the challenge. Love your card!! I love this layout!!!!! And that texture!!! AWESOME! Beautiful holiday card... as are all your cards!!! Amazing card Jackie! Love it! Very pretty card, I like the layout and al the matching edges. Cute, cute, cute! Both my daughters want to use this set for their Christmas cards, so I will have to send them your link! Thanks for the inspiration! You must be really happy to be finished with the bridal stuff! Your card is gorgeous with very nice colours! Boy have I been remiss in my blog visiting! So many beautiful new things you have created! I love that stamp set, your card is fabulous. 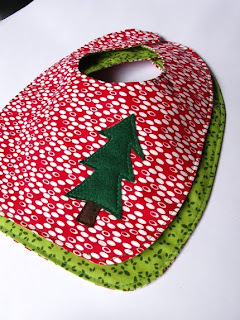 I love the punched edges...those bibs were perfect inspiration. Jackie, You always do such a great job on the challenge with an inspiration piece! I love how the colors match...Great card! 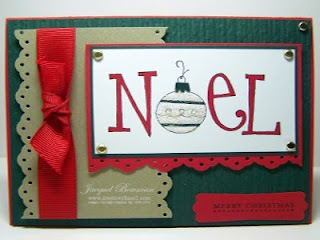 Your card is beautiful, Jackie....love the Christmas colors and the image with the ornament is really wonderful!!! I like the card. Great layout and colors. Fun 3D swap too. I love the reindeer ones (with creative antlers) and the bag. It's hard to see the rest in the picture, but I'm sure they're fun too. Seriously Jackie this is a great job on last weeks inspiration you really did such a perfect job on that inspiration piece!! !